A landscape by Van Gogh will be on display for the very first time in over 100 years, after evidence has been revealed that it is by the artist. Two handwritten numbers on the back of the piece are the evidence that it is from the same list of Van Gogh's works listed by Johanna,the wife of Theo, Van Gogh's brother. Johanna was responsible for bringing Van Gogh to the forefront amongst critics and dealers, as she organised exhibitions. 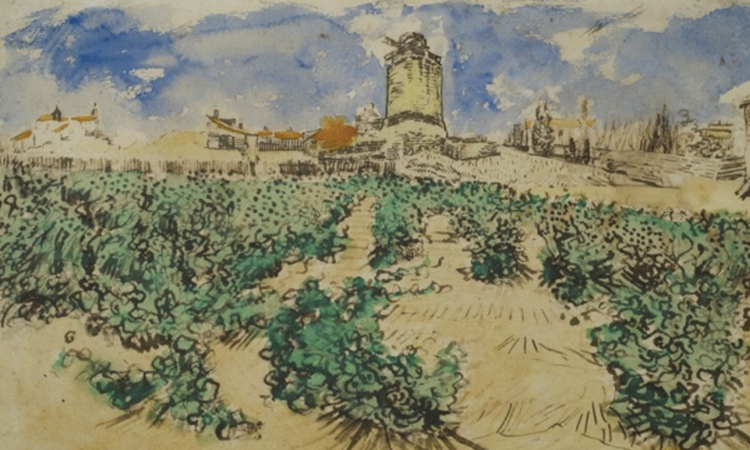 The landscape in question is Le Moulin d'Alphonse Daudet à Fontvieille, a work on paper in graphite, reed pen and ink and watercolour which Van Gogh made after he came to Arles, south of France. The piece is dated 1888, two years before his death. British art dealers James Roundell and Simon Dickinson researched the piece, working alongside Amsterdam's Van Gogh Museum. The piece will be revealed at TEFAF, Maastricht this Friday. It has a price tag "in the region of $10m (£6.6m)." Roundell commented that the number "5", written by Johanna, corresponds with the list she constructed in 1092, and the other number corresponds with her list from 1912. He commented:"So you're getting a double reinforcement of lists that come direct from Johanna ... I'm excited that we're able to bring to light information about a drawing which really wasn't known." "Johanna was left with the life's work of this artist, her brother-in-law who, in theory, she had mixed emotions about. But she set about trying to build ... a legacy for him. She could have just burned the lot because, at that point, Van Gogh had no real market." The piece was last exhibited in 1910 in Germany, and until now has been private collections across Europe.